2008 was a good year to be an artist in South Africa. 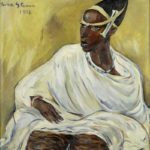 Unprecedentedly high auction prices for South African modernist paintings at Christie’s and Bonham’s in London last year hinted that the global art market would train its speculative eye down south, and local art dealers thought as much too. Ross Douglas, director of Artlogic and the Jo’burg Art Fair, suggests that although global art-buying is flagging, the long-term future of the South African market as promising.